As is usual when camping, I was awake very early. Having lived in Tenerife for 6.5 years, I had forgotten how ridiculously early the dawn is in the UK at this time of year and it was somewhere between 4 and 5am when the birds started their infernal racket - sorry, 'dawn chorus'- and the sun began to chase away the darkness. The other thing I noticed was how cold I was. I had experienced this problem on my Coast to Coast hike in 2011 and realising that my sleeping bag was not man enough for the job, had purchased a fleece liner before the trip in the hope that it would solve the problem, but obviously it hadn't. This was another problem I had with camping gear that was to bug me during the early part of the walk. I lay for a while hoping that I might drift off to sleep again but soon realised that this wasn't going to happen so decided to fire up the stove and make a cup of coffee. After breakfast, I made my way to the shower block and it was then I realised just how cold it was. It felt to me that it would only take a drop of a couple of degrees before I would be scraping frost off of the tent but perhaps my years of living in Tenerife had made me soft, it certainly felt too cold for the middle of May anyway. After breakfast,I began packing up and was soon ready for the start of a walk that I had been planning in my head for the best part of a year. I made my way out to the road without seeing a soul and took a 'selfie' of me in front of the first Pennine Way signpost opposite the Old Nag's Head, where I had spent a pleasant, if solitary evening the day before. There was no-one there to wave me off, so I opened the gate to the start of the path and started my adventure. Although the weather was fine with only a few puffs of cloud scudding across the sky, there was a cold blustery wind blowing and as I followed the flagstones through the sheep, I debated if I should put on my fleece jacket as I felt quite chilly in my T shirt but I decided to wait and see if the walking would warm me up. 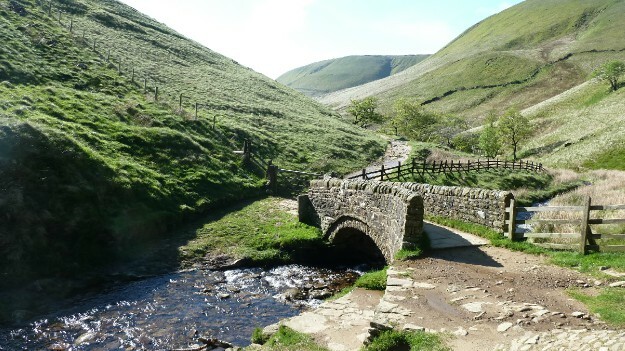 The first section was memorable for the ease of walking through the fields on the flagstoned path but more so for the stunning views of the Vale of Edale, which opened up slowly as I gently climbed. 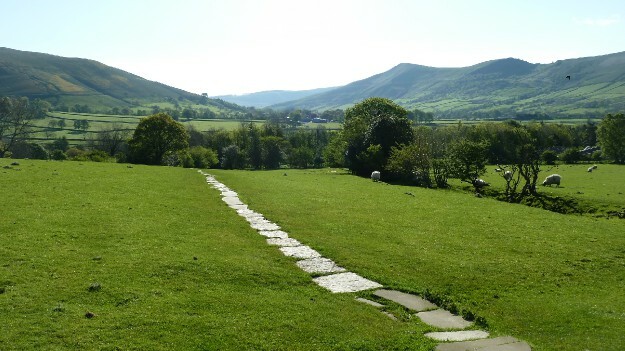 These flagstones proved to be a blessing as much of the original start of the Pennine Way had passed through peat bogs causing many to abandon the walk after the first day. Now the start of the walk takes an easier route and much of the boggier sections are paved in this way. I passed through the tiny settlement of Upper Booth and followed a lane above a river to the stone bridge that signalled the start of the first climb on the walk known as Jacob's Ladder. 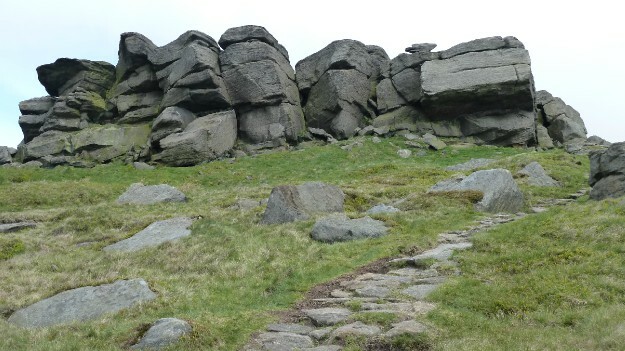 This is a steep, stony climb to Kinder Low on the Kinder Scout plateau and although I had to occasionally stop to catch my breath, it didn't cause me any real problems and I was quietly encouraged by the fact that I had hauled my full backpack up to the top without due concern. I passed the imposing bulk of Edale Rocks and soon arrived at Kinder Low without any problems. I was using the 'Trailblazer' guidebook, which utilises an unusual method of describing the route. This comprises 135 hand drawn maps, maps drawn by walkers, with all of the route directions written on the map instead of a separate block of text, thus avoiding the necessity of trying to locate your place in the text while switching between it and the map. Once I got used to using the book, I loved it, which is just as well because I had decided to carry no other maps. Much as I love using OS maps, on a walk of this length, the bulk and weight involved in carrying so many made them non-viable. I had therefore decided that the guidebook had enough detail, coupled with the signposting of what is after all a National Trail to negate the need of carrying a library of maps around. As a back-up, I had stored the whole route on my Garmin GPS which I had downloaded from the Trailblazer website. In the event, I only switched the GPS on once on the last day to help me locate the way out of a grassy meadow, although things may have been different had I encountered bad weather with reduced visibility. As it turned out, despite the forecast threatening rain for most of the trip, I walked in fantastic weather for the whole of my walk on the Pennine Way. From Kinder Low, I easily located the path around the edge of Kinder Scout and stopped for a chat with a walker out doing the 8 mile circuit from Hayfield. I remembered this walk vividly as it had been the first serious hillwalk I had ever done many years earlier with my wife. 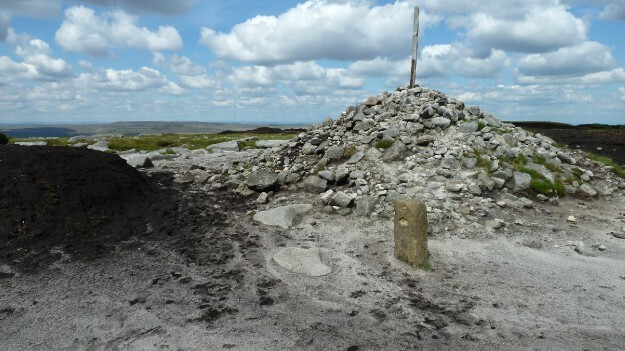 I well remember climbing up William Clough and feeling like an imposter as I greeted other walkers that passed us, worried that they would start asking questions and discover my inexperience. As the walker bid me good luck and I carried on around the edge of the plateau, I was struck by a wave of nostalgia as I remembered that walk and felt suddenly very alone. I normally love being out on the hills with only myself for company but today I felt it would be wonderful to have my wife along. After a while, the feeling passed but as I approached Kinder Downfall, a narrow thread of water tumbling over the edge of the Kinder Plateau, I stopped for a breather and took out my mobile phone. I was happy to note that I had a signal and as I sat and ate, I sent a text message to my wife and to my parents to let them know all was well. As I sat, two walkers passed by and I bade them good day and they carried on their way but I was to bump into them numerous times over the following two or three days. Continuing my walk, I soon caught them up as they sat for a break and I discovered that they were going as far as Horton-in-Ribblesdale, over 90 miles into the walk. The descent from Kinder Scout was quite steep and I recalled many years earlier walking to the edge of the plateau to this point with my brother in a whiteout and being surprised to see clusters of small horizontal icicles attached to the wires of a chain-link fence. Luckily, the conditions today were far more benign and I soon turned right at Mill Hill onto a featureless moor called Featherbed Moss. This part of the walk was all slabbed and made for easy walking and as I crossed it, I looked across to the Kinder plateau and the hills ahead and wondered what this section would be like in driving wind and rain as it felt fairly inhospitable even in fine weather. After crossing the Snake Pass road, I walked a little further before stopping for another break at the side of the path as the two walkers passed me again, only to stop a little further along allowing me to regain the 'lead' when I started walking. I splashed in and out of the Hern Clough stream a few times as I followed it to my next objective, Bleaklow Head and continued across the peat to Wildboar Grain and began my descent. I was fairly tired by now and was becoming slightly irritated by the hip-belt on my rucksack, which seemed to slacken off considerably every few minutes, necessitating a sharp pull to retighten it. It wasn't a big deal but it was probably that I was tired that I began to find it annoying. 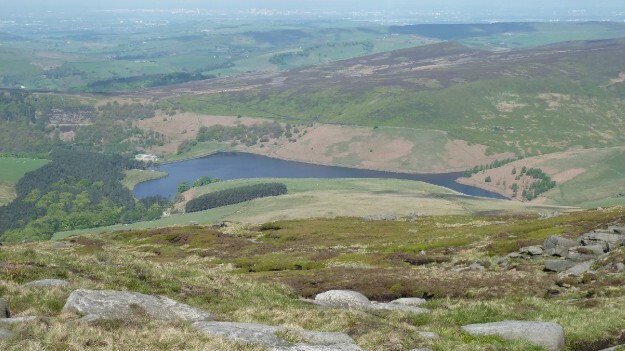 The Longdendale Valley and Torside reservoir was now in view and as I descended very steeply now, I fell into conversation with one of a group of three walkers from Huddersfield out walking a circuit in the Longdendale Valley. It was nice to chat to someone after spending most of the day alone and it was with a little regret that I said goodbye to them as our routes parted company by the road alongside the reservoir. 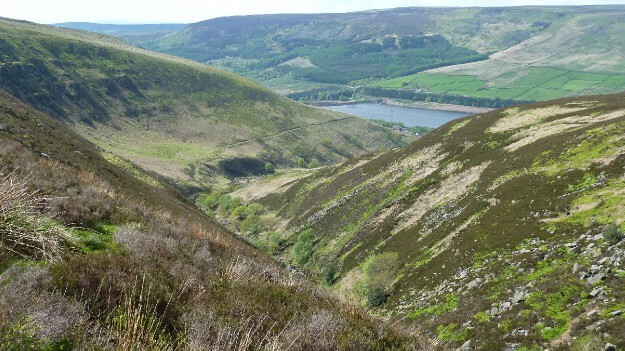 I'm not sure if it was tiredness or that I had psychologically finished walking for the day after the descent but I found the walk from Torside Reservoir to Crowden campsite extremely tiring and irritating. 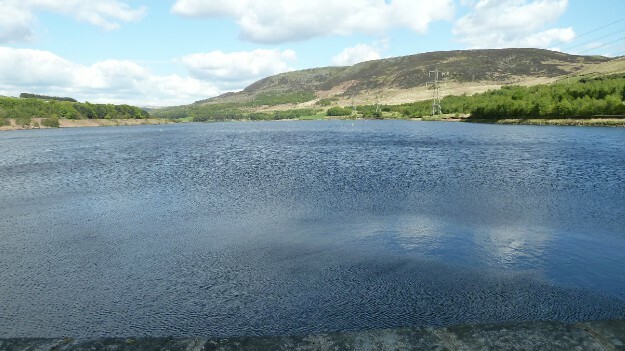 I had to wait an age to cross the busy road on the far side of the reservoir and to cap it all, the access road to the campsite proved to be much steeper than I anticipated. By the time I reached the camp, I was swearing out loud to the sheep, who ignored me and carried on with the important task of munching grass. I arrived at the campsite reception and shop and was booked in by a friendly guy who said that I looked in pretty good condition for someone who had just completed the first day. Apparently, he said, many arrive barely able to stand. I purchased numerous snacks for the following days walk and pitched my tent, after which I showered and prepared dinner on my tiny stove. 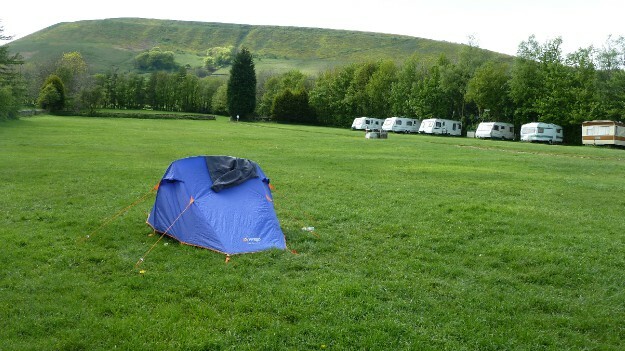 Later, as the sun began to slowly sink in the sky, I went for a wander around the immaculate campsite, which was full of very neat looking caravans with only my small tent disturbing the orderly lines and soon retired to my tent where I was very quickly asleep. I had been walking for 8.75 hours and my body demanded I rest.